The Home Inspection Hub Is currently running a Spring Special promotion for all our new clients. 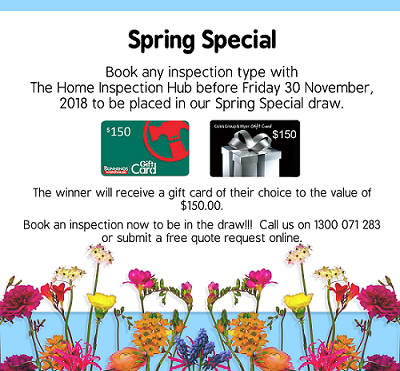 For any client who books an inspection with The Home Inspection Hub between now and 30 November, 2018, they will be placed in a draw to win either a Bunnings or Coles/Myer gift card to the value of $150.00. The Home Inspection Hub offers residential inspections across metropolitan Melbourne and into Central Victoria. You can phone us on 1300 071 283 or email for a free online quote today. Should you have any queries, don’t hesitate to call us on 1300 071 283 or email info@thehomeinspectionhub.com.au.